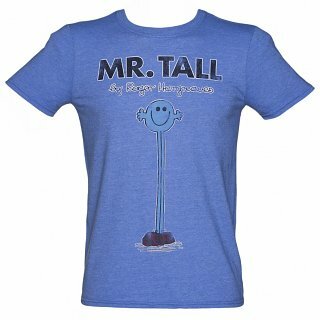 Customer Reviews of "Men's Heather Blue Mr Tall Mr Men T-Shirt"
Great t-shirt. Good quality material. Parcel dispatched and delivered promptly. T-shirt good quality material. Fun selection of unique products. I think that Ron Hargreaves would be pleased to see his work being worn. Good quality and exactly what I was looking for as a themed event in my place of work. Perfect in every way.\rGreat tshirt, good quality fabric.\rArrived earlier than expected. Lovely men\'s shirt, sizing is pretty good. Good quality, well packed, arrived quickly! T shirt of reasonable quality for the price.